JIM ASPINWALL is Adjunct Professor of Mathematics at Florida Southern University, and on the board of a private equity firm, an investment bank and managing member of a hedge fund. With over 30 years in the business, Jim has a wide range of experience. At Chase Manhattan Bank he was the prime developer of Chase's REALM system, a risk management and derivatives pricing system, which was used, by Chase Manhattan Bank and over 200 clients around the world. While at Chase Jim was involved in Project Cloud, which was a state of the art Artificial Intelligence system that could forecast changes in credit rating 2 years out with a 95% accuracy rate. He has also has experience at other major Investment Banks, including Banc One and Nomura, Japan's largest Brokerage house, where he was involved in credit arbitrage trading and the creation of large credit structures. While head of quantitative research and development at Abbey National Jim over saw the development, pricing and risk management of multiple structured products such as trigger swaps and power reverse dual currency bonds and was involved in the start up of Abbey's Credit Derivatives desk, Jim was in the undergraduate Liberal Arts program ar The Ohio State University and studied Theoretical Math at the University of Cincinnati's graduate Mathematics program and quantitative finance in the MBA program also at the Unviersity of Cincinnati. GEOFF CHAPLIN studied mathematics at Cambridge (MA 1972) and Oxford (MSc 1973, DPhil 1975) and trained as an actuary (FFA 1978) while working in a life insurance company. He moved to the City in 1980 and has worked for major banks (including HSBC, Nomura International, and ABN AMRO). As a partner in Reoch Credit he has consulted to law firms, hedge funds, corporate treasurers, institutional investment funds and risk control departments of major banks in the areas of credit and mortality risk. He has been involved in the credit derivatives market since 1996 and life settlements structures since 2003. Geoff has also maintained strong academic interests – he was a visiting (emeritus) professor at the University of Waterloo, Canada, from 1987 until 1999. He has also published many articles in Risk, the Journal of the Institute and Faculty of Actuaries, and others, speaks regularly at conferences and is the author of “Credit Derivatives: Risk management, Trading and Investing” published by John Wiley & Sons Ltd, 2005. MARK VENN isManaging Director of Clearlife Limited, and President of ClearLife US affiliate, ClearLife Inc. ClearLife was founded by Mark in November 2007. It supplies trade processing, evaluation and risk analysis services to participants in the life settlements and premium finance markets. These services are provided through ClearLife™, data management network, ClariNet™, which allows investors in life settlements and synthetic longevity risk to interact in a secure manner with external service providers and other market participants. Prior to founding ClearLife, Mark established Mizuho International plc's Asset Finance Group in 2005 a principal investment team formed to focus on the life settlements market. Mark recruited and managed a team of six front office professionals and worked with Mizuho™, support teams to build a dedicated legal, information technology and operations infrastructure for life settlements. Through this process, Mark gained invaluable experience in designing and developing business procedures, information technology and risk management systems, tailored to the specific requirements of longevity and mortality risk. He also initiated and maintained relationships with key service providers and counterparties in the life settlements market. Over two years, Mark grew Mizuho's life settlements portfolio to over US$1.2 billion in face amount. While at Mizuho, Mark also founded the Institutional Life Markets Association (ILMA), which has become the leading trade association for institutional participants in the life settlements and premium finance markets. Mark joined Mizuho in 2000 with two colleagues to co-found Mizuho™, Structured Credit Products Group, which completed US$3 billion in synthetic US high yield CDOs. From 1993, Mark worked for Credit Suisse First Boston and Credit Suisse Financial Products and was based in Hong Kong, London, New York and Tokyo over this period, specialising latterly in credit derivatives and synthetic CDOs. Mark holds a master's degree in law from Cambridge University and qualified as a barrister in 1990. 1 Life Insurance: Primary and Secondary Markets. 1.1 History, application and termination of life insurance policies. 1.1.1 History: Early life insurance. 1.1.3 Insurance moves to America. 1.1.5 Applications of life insurance. 1.1.6 The parties involved in a life insurance policy. 1.1.7 Life insurance and life assurance. 1.1.8 Termination and surrender of life insurance policies. 1.2 Life Insurance policy types and underwriting. 1.3 Development of the viatical settlement and life settlement markets. 1.4 The parties involved in a life settlement transaction. 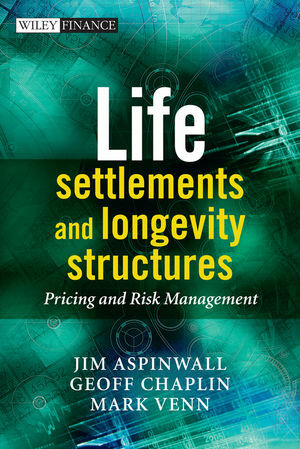 1.5 The life settlement process. 2 Mortality and Credit Structures, Valuation and Risk. 2.1 CDS and CDO contracts. 2.1.3 Synthetic and cash flow CDOs. 2.2 Valuation approach and data. 2.4 Single life mortality calculations. 2.4.1 Corporate mortality: CDS contracts and bond pricing. 2.4.2 Generic life policy valuation. 2.4.4 Risk analysis in the life assurance context – mortality curve stresses. 2.5 Correlation and portfolio calculations. 2.5.3 Gaussian copula and correlation in CDO structures. 2.5.4 Correlation in life insurance. 2.7 Risk management of a structured life settlements portfolio. 2.7.1 Risk managing a book of traded financial assets. 2.7.2 Risk managing a portfolio of mortality risks in an insurance company. 2.7.3 Risk managing a life settlements portfolio. 2.7.4 Current risk management software. 3 Structured Products and Securitization. 3.1.1 Other examples: Synthetic securitization. 3.3 The risks of structured products. 3.3.1 Problems with correlations and volatility. 3.5 Life Settlement pool (LSP). 4 Examples of LSP Securitization: A Principal Protected Fund. Appendix: Sample product description outline. 5 Capital Markets Products: Principal Protection. 5.2 A zero coupon bond. 5.4.1 The convertible is exercised. 5.4.2 The convertible is not exercised. 5.6.1 The longevity bonds: Principal at risk. 5.6.2 Longevity bonds: Coupons at risk. 5.6.3 The inverse longevity bond. 5.9 CIOs and PACs, TACs and VADAMSs. 5.9.1 A collateralized insurance obligation. 5.9.3 PAC bond – breaching the boundaries by 40%. 6 Structured Financing: Guaranteed Loan repayment. 6.1 Project financing: Commercial and industrial uses. 6.1.1 Purchase of a restaurant chain. 6.2.2 Credit enhancement for the retail borrower. 6.3 Reverse mortgage or equity reversal programme. 6.4.3 Risks of this transaction. 6.6 A New CPPI product. 6.6.1 The initial CPPI study. 7.2.2 Mortality swap: Single payment. 7.2.3 Mortality swap: Multiple periods. 7.3.1 The forward mortality rate. 7.5.1 Review of option pricing models used to price mortality options. 7.5.2 Options on longevity bond future. 7.5.3 Options on the longevity spot bond. 7.5.4 Put option on the longevity of the pool. 7.5.5 Mortality caps, floors and swaptions. 8.1 Hedging longevity or extension risk. 8.1.5 80% runoff with no annuity vs. an annuity. 8.1.6 40% runoff with no annuity. 8.1.7 40% runoff with single premium annuity. 8.1.8 80% runoff with an annuity payout per year. 8.2 Hedging with inverse longevity bond. 8.2.1 Hedging with a surety bond. 8.2.2 Hedging with an insurance wrap. 8.2.4 Hedging with a mortality swap. 8.4.2 Put option on the longevity. 8.5 Caps, floors and swaptions. 8.6.2 Establishing a liquidity provider. 8.6.4 Borrow against the portfolio. 8.8 HER (Hedge efficiency ratio) for an inverse longevity bond. 8.8.3 Effectiveness of a hedge: the calculation. 8.8.5 HER for an annuity. 8.8.6 HER for an inverse longevity bond. 8.8.7 HER for a mortality swap.